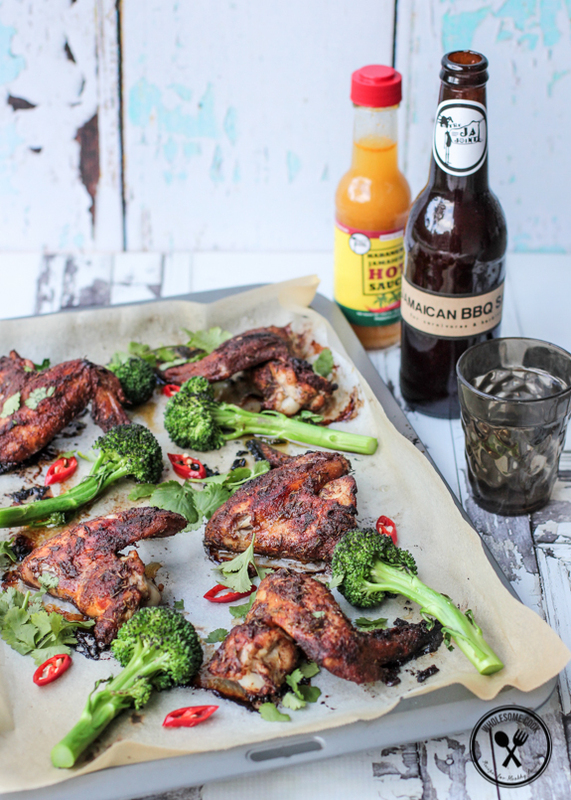 Jamaican Jerk Chicken is a classic in its own right, and now it’s even easier to recreate the authentic flavour with a 100% natural, gluten-free and preservative-free spice blend from Ja Joint. The spice blend is just as fantastic with fish, roasted vegetables, in meatballs and pasta sauces. Even on those grilled cheese toasties! I’m not entirely sure where my infatuation with all things spice came from, but it’s one that I cannot really complain about. Spices have an inherent ability to bring even the most bland dishes to life. I adore a hint of red curry paste in my Spaghetti Bolognese, and often add a pinch of cinnamon to smoothies, granola and yoghurt. I also like more than just a hint of heat. On a scale of zero to hiccup-inducing Sichuan at 10, I am probably somewhere around the eight-and-a-half mark. This is why I absolutely adore things like Thai curry pastes, laksa and now, after trying Ja Joint’s authentic Jamaican Jerk and Curry Spices, I am totally head over heels in love with the perfectly balanced blend of flavour and chilli heat. The Ja Joint offering has been endorsed by the Hon Consul for Jamaica in Australia as the best product for home cooks to try Jamaican food at home. The Jerk rub contains a mixture of garlic and onion powders, thyme, chilli, paprika and pimento powders, cinnamon, salt and brown sugar. Handcrafed in Brisbane using local ingredients, both the spice mixes and sauces are gluten-free and free from additives and preservatives. You can buy Ja Joint products here. Not only are they great value and super tasty, Ja Joint is a brand with a conscience. The packaging is eco-friendly and recycled beer bottles are used for the oh-so-good Jamaican Ginger BBQ Sauce. The brand also supports indigenous empowerment programs. Customers donate 5% of sale profit to IMP who empower disadvantaged indigenous youth through running and healthy eating. The brand mission is to employ disadvantaged indigenous youth and empower the kids through healthy food & lifestyle programs. How great is that? 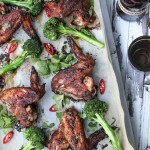 As for the chicken wings, they are perfect spiced with just the authentic Jamaican Jerk spice blend, but if you’re feeling a little indulgent a spoonful of the wonderful Ginger BBQ Sauce will really make them sing. I had trouble stopping at a single serving of these. Not to mention that the jerk pork meatloaf I made using the spice mix disappeared quicker than I could instagram a photo. As did the roasted Jerk pumpkin salad. Thanks to Carly for connecting with Wholesome Cook and sending us a Ja Joint pack to try. I can see already, there’s a lot more jerking around in our future. I used organic chicken wings from Harris Farm (they were reduced by 30%) and Ja Joint Jamaican Jerk Rub to marinate the wings for 12 hours before baking. Allowing the meat to marinate in the spices helps the flavour develop but is not necessary. The spice mix goes well with fish, roasted vegetables, meatballs, meatloaf and I can imagine it would taste nice in a pasta sauce. 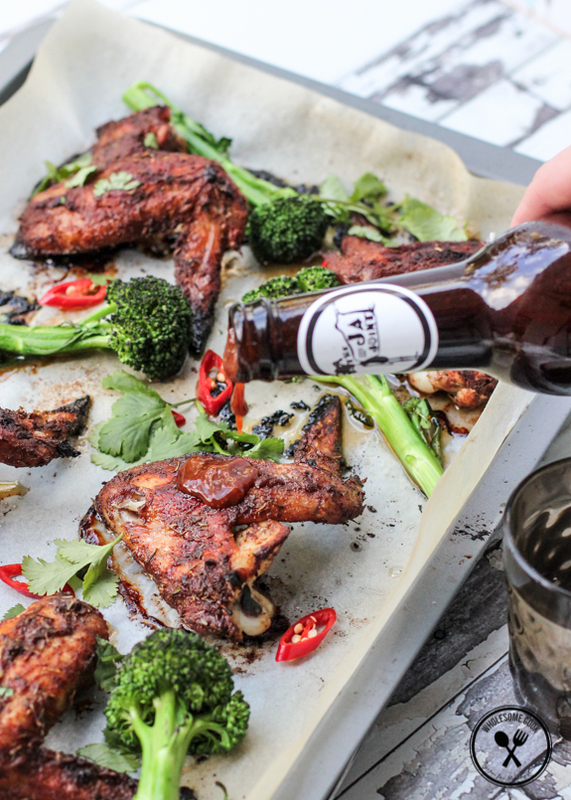 If you prefer to cook your wings on a bbq, you can finish them off on a hot bbq grill after baking in an oven at 190C for 30 minutes. Place chicken wings in one layer in a ceramic bowl. Sprinkle with the Jerk seasoning and rub well into the skin. If time allows, cover with cling film and refrigerate for 12 hours. 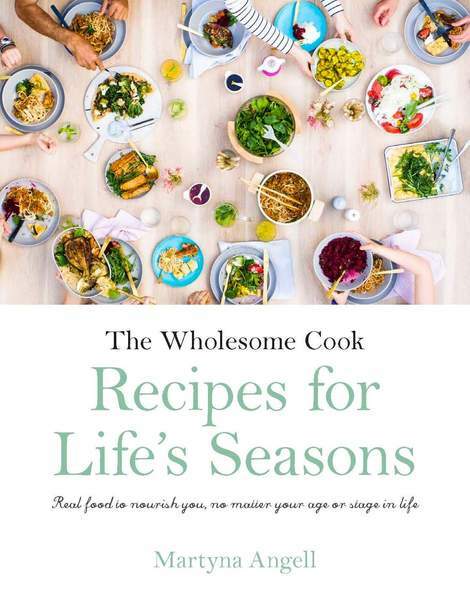 Otherwise, set aside while you prepare the broccolini. Pre-heat oven to 190C (170C fan-forced, 375F, gas mark 5). Steam or cook whole broccolini stems for 2-3 minutes over / in a pot of boiling water. Remove from pot and set aside. 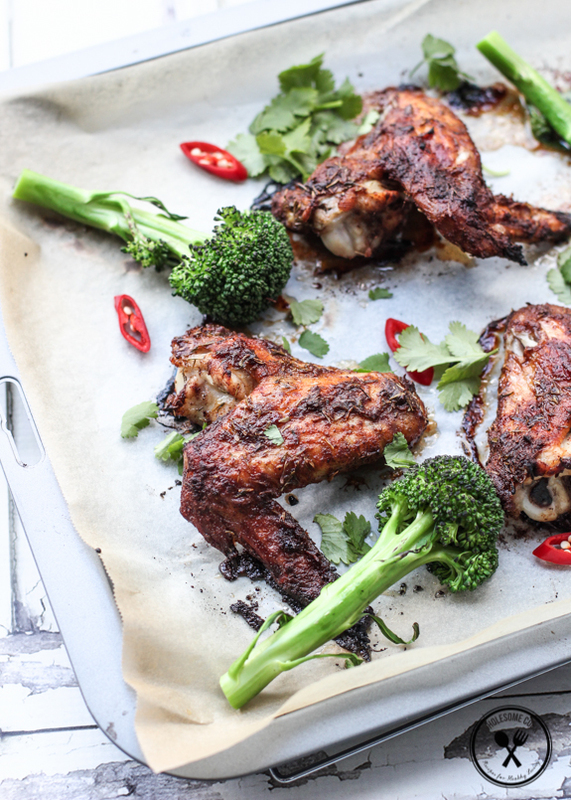 Rub each wing with a little olive oil and place on a baking tray lined with baking paper. Sprinkle with sliced chilli and bake on the middle shelf of the oven for 30 minutes. 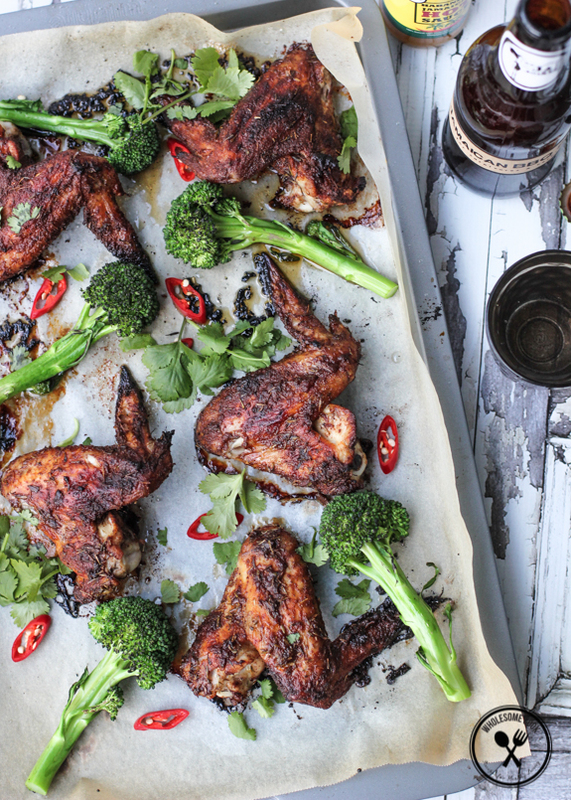 Add broccolini to the baking tray then return wings to the oven for a further 15 minutes. Sprinkle fresh coriander leaves over the hot wings. Serve with Jamaican BBQ sauce and lime wedges, if you so wish. You just gave me an idea for our 4th of July cookout! I haven’t had jerk chicken in a loooooong time, cravings are coming back. Awesome man food! Gotta love good spicy wings with a few beers. Perfect Friday night feast. I bought some chicken wings today and will try to recreate the spice mix (we are in New Caledonia). Thanks for the inspiring post. I actually bought this spice mix from a local butcher’s the other day. I wasn’t sure what to do with it so loved your ideas. Were your kids ok with the spice levels in say meatballs? These look amazing! So crispy and spicy. I’ve been thinking about jerk chicken for a little while now so I’ll have to check out this spice paste. These must be he best looking wings I’ve seen in a while. I’m a big buffalo wings fan but I think you might have converted me to jerk. Must check out the spiice mix. I love jerk chicken and have since I went to Jamaica and ate some in the middle of nowhere that had been cooked on half a metal drum. It was a risk, I know but good grief it was good. I’m getting some of this! Hi Maureen, these are the best sorts of risks… I love trying the most authentic of dishes and love doing so off the nested tourist track. While I’m yet to visit Jamaica, I truly like the flavours! those wings look so delicious!